In computer science, garbage in, garbage out (GIGO) describes the concept that flawed, or messy input data produces poor, unrecognisable output or “garbage”. Essentially, a system is only as good as the data you put into it. This may seem like a basic principle, but if not followed, it can be a massive exercise to try and clean up the data in your system at a later stage. From ResRequest’s perspective, “garbage data” can be found in areas such as duplicate contacts, reservations info and poor housekeeping of agent/guest CRM etc. The “garbage data” becomes very apparent when you want to start reporting on this information. If the data being inserted into the system is not “clean”, you will not be happy with the results when you try and use the data. Why would you want to keep the data in the same format? Not only will your reports look so much better, searching for reservations in your system will be so much easier if the information follows the same format. If you decide to run a mail campaign, to target guests from the USA, the guests who don’t have this info attached to their contact would be left out of the campaign so you would lose potential business due to the information not reaching the right people. Overall, the benefits of inputting and maintaining neat data in your system are so worthwhile and will save you a lot of time in future! What tools are available in ResRequest to help keep your data clean? 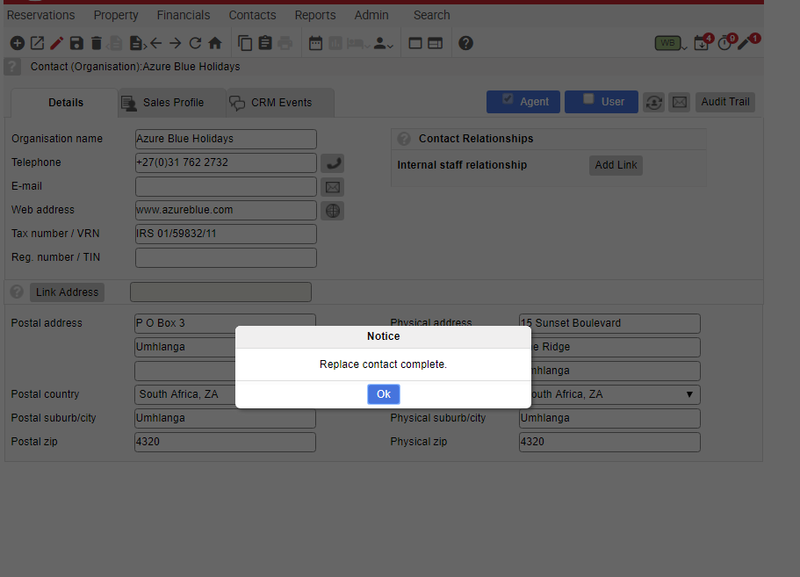 Replace contact: Deleting contacts isn’t so simple once the contact has been used on a reservation so we’ve given you the functionality to replace a contact with another contact. This means that all the relevant links (for reservations and financial folios) of the replaced contact will transfer to the remaining contact. Duplicate contact check: When adding a new contact to your system, ResRequest prompts you to check if the contact you’re adding is a duplicate of an existing contact. For example, when inserting the name “John” while adding a new contact, the ResRequest system will display all existing contacts’ named “John”, so the user can determine if it is an existing contact or not. Although it would be great for the system to prompt you in all areas where data is inserted, at the end of the day, you are the owner of your data and it is up to you to keep the data in your system in good order.